Check out the ERS Carpet Cleaning website if you need more info about residential or commercial floor cleaning. You’ll also find carpet cleaning prices and great reviews specific to carpet and upholstery cleaning. The carpet and tile cleaning specialists at ERS will get your floors back to pristine condition – even if your child ground meatloaf into the carpet or your dog tracked mud all over the house. It doesn’t take much for a nice carpet to become discolored or for tiles to lose their luster. What’s worse, regular cleaning supplies aren’t strong enough to truly restore your flooring. Our field technicians use high-end truck mounted carpet cleaning equipment and special cleaning solutions to give your carpet the deepest clean possible. All of our Milwaukee carpet cleaning technicians are IICRC-certified, so when you hire ERS you know you are receiving highly skilled professionals ready to give you the most effective service. After the carpet is prepped, we apply conditioning product to the carpet and use the truck-mounted vacuum to cleanse the stains. After the carpet is washed and the stain is removed, we rake the carpet so it looks groomed and tidy. We finish by speed drying the carpet. Your floor will dry in an hour or two, instead of the day or two most other carpet shampooing services take. For many homeowners and businesses, constant foot traffic means a fast accumulation of dirt and gunk on their tile and grout lines. Tile and grout collect a lot of dirt over time and create an eyesore if not washed frequently. Certain tiles should only be cleaned with certain solutions to avoid accidentally stripping the finish. Our certified cleaners know which substances to use on your flooring material. Shown above: why carpet replacement usually isn’t necessary. This level of carpet cleaning is only possible with a truck-mounted system. 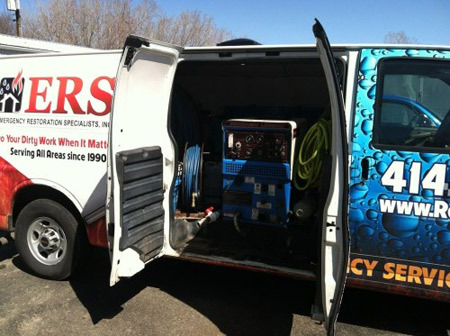 ERS also provides reliable tile cleaning services in Wisconsin. Our special tile cleaning solutions and techniques keep your floors looking like new. Some grout cleaners have to sit for 24-hours to be effective. With ERS, our methods are more efficient and effective to quickly restore your floor. 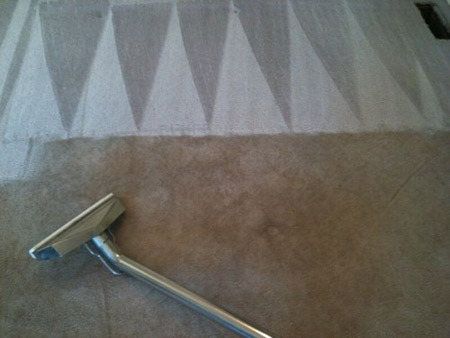 We not only remove stains, we thoroughly clean the entire area. ERS guarantees you will be satisfied with our services whether you need your tiles or carpets scrubbed. When we’re through with your floors, you won’t be able to tell where the stain even was. Owning a pet often means dealing with accidental stains around your home. New puppies and kittens might not be fully house trained, leaving you with multiple little accidents all around the house. These stains are visually unappealing, but also create odors and expose your family to bacteria if left untreated. Traditional household cleaners might provide a temporary fix while permanently discoloring the carpet or tile. At ERS, our floor cleaning services applies to removing pet stains from your home. Our truck-mounted system provides extra power for deep-stain removal. We use an antimicrobial solution to sanitize the area where the stain was. Our IICRC-certified carpet cleaners will make your floor look good as new at an affordable price. Cleanings are available 24/7, so don’t spend another day with unhealthy and unsightly stains! When you have your floor cleaned by ERS, you’ll want to have the rest of the building thoroughly cleaned as well. Our technicians provide furniture and upholstery restoration along with air vent cleaning. When these services are combined with our floor cleaning, your entire home or business will benefit. Air vent cleaning goes deep into the duct system of your home to remove all traces of dust, lint, and mold from the air. For family members with allergies or asthma, this will make it easier for them to breathe while improving the general air quality. Removing debris from the vents also makes general cleaning easier, since fine particles are no longer being circulated throughout your home. Furniture at your home or office goes through a lot. Even if there are not obvious spills, fabric can become discolored over time from dust and wear and tear. Rather than buy expensive replacements, call ERS. Our technicians will restore each furniture piece so you can keep on enjoying it. If your floor has been damaged during an emergency disaster, ERS is here for you. Our special cleanup and decontamination services restore your home or business, no matter what the circumstances. We’ve seen, smelled, and cleaned it all after 25 years of experience. If your home was damaged by flood, our water removal will first dry out your floors before we start cleaning. Fire and smoke damage can leave odors in carpets and discolor tiles. Our deep cleaning removes soot residue from your floors, walls, and ceilings. No matter the emergency, our cleaners are available 24/7 (including holidays) to ensure your home or business is cleaned up right. Hear what our satisfied cleaning customers have to say about our services. CONTACT CARPET AND TILE CLEANING PROFESSIONALS AT ERS TODAY FOR SPOTLESS, BEAUTIFUL FLOORS.